As discussed in past posts, the overall ex parte appeal statistics for the USPTO indicate that examiners are reversed or reversed in part in approximately 38.6% of appeals across all art units. Some art units have an unusually high reversal rate, such as art unit 3700. However, it should be appreciated that many appeals have multiple grounds of rejection. And since if any single rejection of a claim is affirmed (even if other rejections of that claim are reversed), the decision is still counted as a full affirmance in the above statistics. Thus, the data does not suggest that only 38.6% of appealed rejections are incorrect. Rather, the real number is much higher since the applicant only gets a reversal (or reversal in part) if each and every rejection of a claim is overcome. A recent case illustrates the all too common situation where an Examiner throws every possible rejection they can think of hoping that one will stick, or the applicant will simply give up. The case is SN 12/980,840. The invention relates to a method of positioning an electrode cuff on a hypoglossal nerve of a patient. The examiner not only used restrictions to limit the applicant's ability to amend (see previous posts here and here and here, as a few examples) but threw every type of rejection they could think of, including Section 101 rejections (Alice), Section 112 rejections (written description), as well as prior art rejections. While the applicant here was successful in obtaining a reversal, they had to run the table in overcoming each and ever rejection. When taking cases such as these into account, it becomes clear that when asking the question of how often are examiners correct in forming a rejection, the answer is much higher than 38.6% of the time. Turning back to the example case of the positioning of an electrode on a hypoglossal nerve, some additional lessons can be learned about how to deal with an examiner bent on rejecting the application no matter what (publically available data indicates that this particular examiner in art unit 3762 is a clear statistical outlier in rejecting cases at a much higher rate than other examiners in that art unit). Here, during prosecution, the Examiner used a "election by original presentation" restriction to block amendments aimed at avoiding the cited prior art. At the same time, as noted above, the Examiner threw improper 101, 112, 102, and 103 rejections at the applicant. But in this instance, the applicant used a great strategy of combining petitions and appeals in a coordinated way (see previous post here). The nice thing about this strategy is that it turns the usual statistics that work against the applicant on their head by creating statistics that work against the Office. Specifically, the coordinated use of a petition and appeal create multiple chances for the applicant to win in parallel, rather than requiring the applicant to run the table on every issue. If the petition is successful, the applicant obtains a new non-final action and the ability to make desired amendments, even if the appeal is unsuccessful. Likewise, even if the petition is unsuccessful, there is still the chance of winning a reversal or reversal in part. In the hypoglossal nerve case, the applicant's petition ultimately was unsuccessful, but they won a full reversal on appeal. It is also worth reviewing the Section 101 rejection in this case as the PTAB confirmed that the claim was not abstract at step 1 (and went on to confirm that even under step 2, the claim was eligible). Of course, many reading this will recognize this basic reasoning as a common tactic for rejecting just about any method claim. 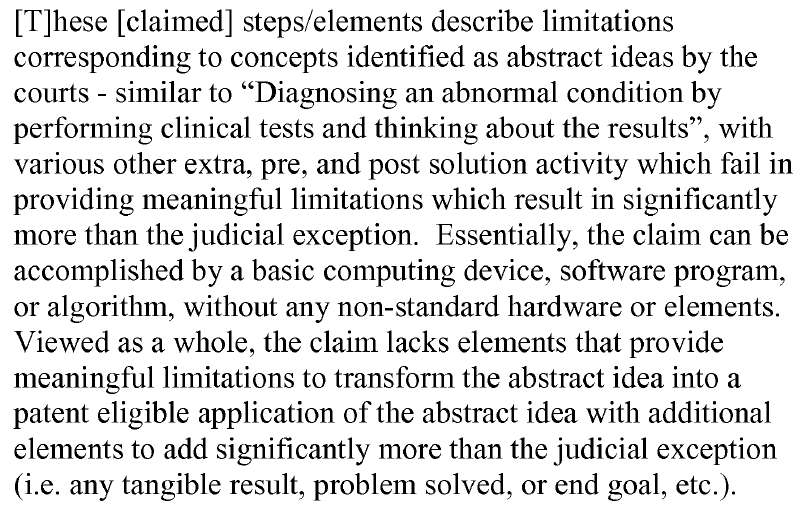 In analyzing the claim, the PTAB first took issue with the fact that the Examiner did not actually identify any particular case which held that the "diagnosing an abnormal condition by performing clinical tests and thinking about the results" was abstract. The PTAB then pointed out that even under MPEP 2106.04(a)(2)(III)(A), and the related cases of in re Grams and CyberSource, the sole physical process step in the claims at issues was collecting data by performing a plurality of unspecified clinical tests, for which little detail was provided in the specification. Because the specification provided little detail on the test and instead focused on the algorithm for analyzing data, the claims were directed to the algorithm itself and were thus ineligible. The PTAB distinguished the "mere data gathering" of the prior cases by noting that the claims required specific steps such as placing a particular device on a particular nerve, using the device to deliver stimulation to the particular nerve, and monitoring the patient's upper airway to determine the response. The PTAB noted that the positioning required specific surgical intervention and that significant details of the cuff were described in the specification. This was therefore enough to conclude that the claims were not directed to an abstract idea, even thought the claims included mental steps of evaluating whether the placement elicits a predetermined response. Thus, even though these mental steps were present, because they were coupled with physical steps (beyond mere data gathering), the claims were not abstract under step 1 of the Alice analysis. So, there are many lessons to be learned from this case, including overall prosecution strategy in dealing with a difficult examiner, petitioning restrictions, and appealing rejections. Further, for medical device inventions that include particular methods that involve mental steps (e.g., by the surgeon), there are ways to successfully navigate a 101 rejection.